Statewide, teachers in West Virginia walked off the job this week in a historic strike, but a group of educators at one school still made sure their students — a majority of whom rely on school breakfasts and lunches — got to eat. The public-school teachers walked off the job to protest for higher pay and better benefits, causing all 55 counties in the state to shut down schools. But teachers at Beckley Elementary School were concerned about kids who rely on school-provided meal programs — 300 out of the 430 students at their school — so the faculty got together and made sure the kids could still eat during the strike. The teachers, who have some of the lowest salaries in the country, pooled their own money and donations from local businesses to make sure the kids ate, a gesture that’s nothing short of heroic. 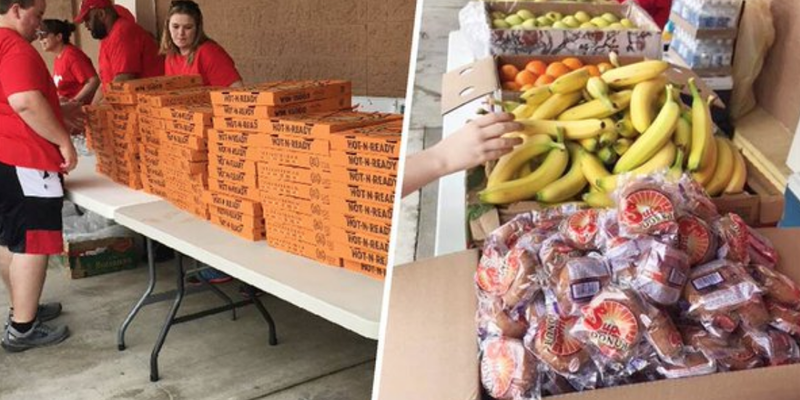 To make sure the kids got to eat, the teachers posted up at a local grocery store with pizza, fruit, and water bottles on the second day of the strike. After catching wind of the idea, local restaurants donated pizza and snacks for the kids, too. At the end of the lunch event, the teachers reportedly had 60 boxes of pizza left and decided to deliver to students’ homes. Parents and guardians of Beckley Elementary students who came out to support the teachers seemed truly grateful for the free breakfast and lunch. In West Virginia, school meal programs are important for student health and educational performance. In fact, according to CNN, 1 in 4 students in West Virginia lives in poverty. For these kids, the meals provided by the school are often the main ones they eat in a day. Beckley Elementary isn’t the only school in the state trying to keep students from going hungry. Across West Virginia, teachers on strike are putting their students’ health first. In Charleston, teachers at Horace Mann Middle School packed and distributed bagged lunches before the walk-out. Educators in Rivesville also put together bags of food for students during the strike. It’s not yet clear whether the strike will result in better wages and benefits, but their efforts to keep kids in their towns fed prove they deserve way more money.